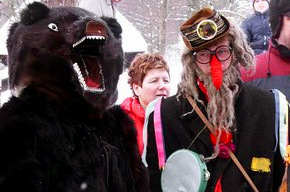 This annual Czech Mardi Gras will be held at the Expo in Cresco, Ia. Malek’s Fisherman Band and the Domaci Czech Folk dancers will perform. Malek’s Fisherman Band is one of the finest polka bands in the Midwest; and continues the great tradition of dance music excellence started by Syl Malek in the 1930's with Malek Bros. Accordion Band. The modern Malek's Fishermen Band plays a wide range of dance music that includes the traditional old tyme polkas, waltzes, two-steps, and schottisches as well as country, big band, dixieland, and other dance hall favorites. Visit their website for more details: www.maleksfishermen.com. Click here for 9th Annual Masopust event poster with details.